Last summer I put a lot of energy into my flower beds, and I waited to patiently all winter to see what would come up this spring. So far I’m pretty happy with the results. 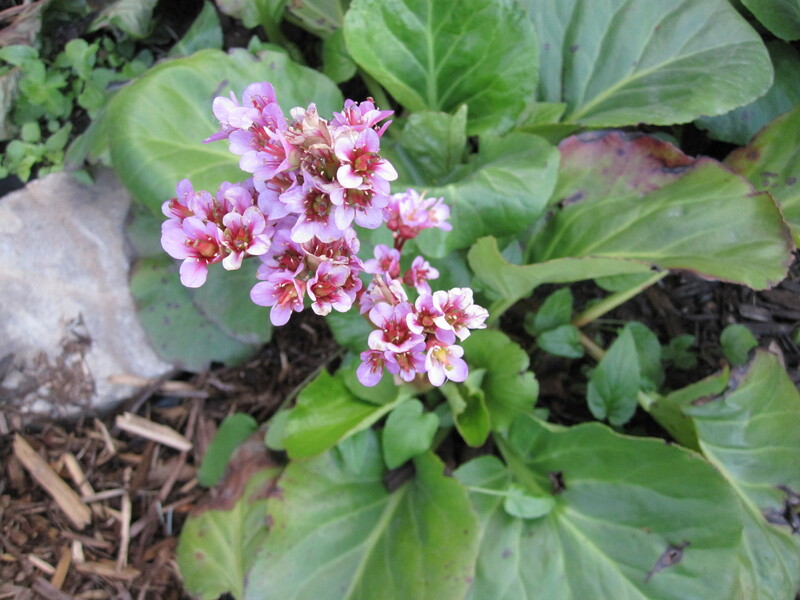 These petite pink flowers of elephant-ears are the first to bloom in the spring and often come up while the plant is still surrounded by snow. I never really appreciated this plant until I learned about its resiliency. They grow in sun, shade, wet, dry or poor soil. That’s why you often see them underneath spruce trees where almost nothing else will grow. Once the flowers are gone you’re left with a carpet of tough green leaves. Last fall I divided my plants and spread them out to cover more ground. 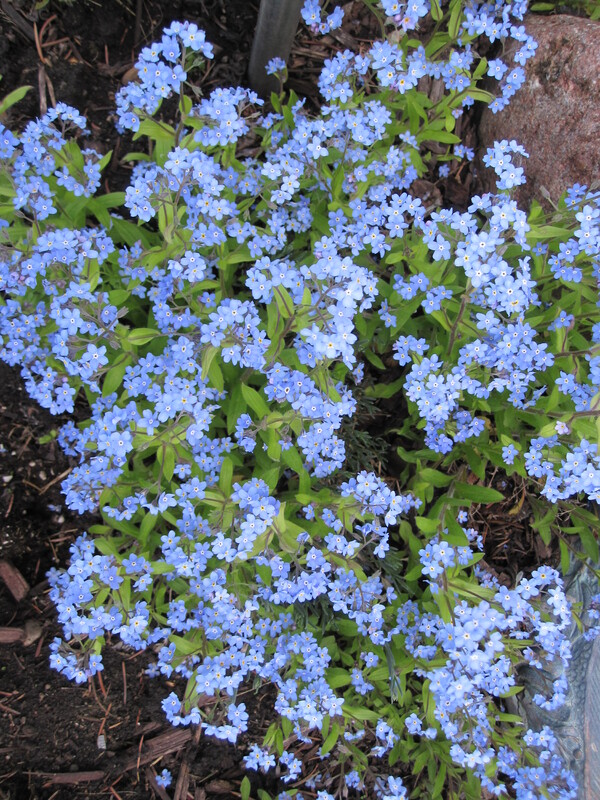 Forget-Me-Not is another early bloomer. They come up as a carpet of tiny blue flowers. I love these because they seed themselves and spread to anywhere that doesn’t already have plant. Yet, they’re easy to remove if they get in the way. It’s so nice to have some color in the garden when the rest of the plants are just waking up. Since these spread so easily, they are a good plant to share with neighbors. Just dig out a dirt full in the spring and enjoy. 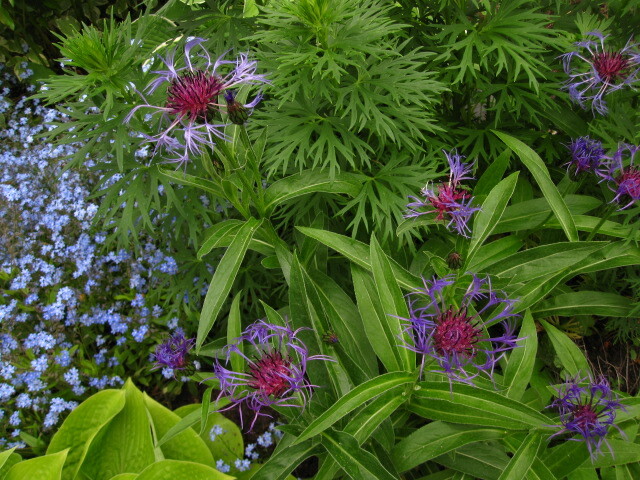 Cornflower (or Bachelor Button) was the next to bloom. I got these from a neighbour last year and I think they’re pretty happy. I really like how the look with the Forget-Me-Nots in the foreground. These are an interesting blossom that look a little like a fuchsia and purple dandelion seed head. Lois says I need to deadhead them, and after the main flowers are finished, I need to cut them back to 1/3 height for second blooming. Check out these hostas! Twelve days ago they were just poking out of the ground. 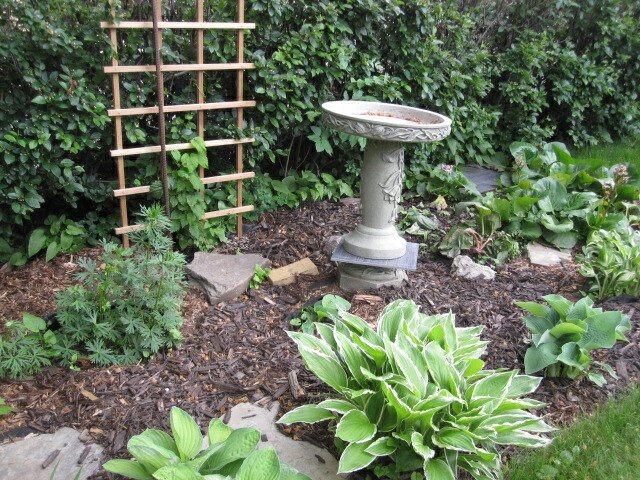 Hostas are a shade loving plant and they look great all season. I especially like the one with the variegated leaves. I divided some of these last year and I can’t wait for them to fill in the entire bed border. Next to the trellis is my new addition, brewers hops. He’s little now, but he’s suppose to grow up to eight meters. And right in front of him are my delphiniums. Last year I moved my delphiniums to a sunnier spot , but it looks like I missed a few. It really is better on the sunny side because those delphiniums are twice as tall. 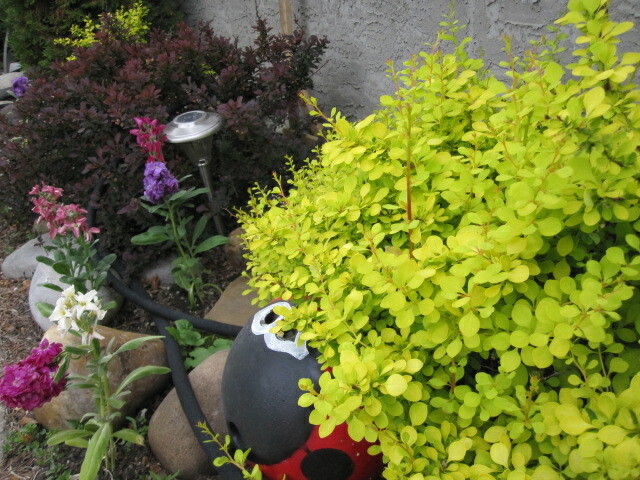 Japanese Barberry and a few annuals. I inherited these shrubs with the house, but I just had to share because they are the perfect plant for the dry and hot spot on the south side of my house. The near one is golden nugget and the far one is concord. They generally do well without a lot of water, but early this spring they were looking a little dead and needed hydrating. They are prickly little plants, so don’t get too close. In a couple of weeks everything will look so different. I can’t wait to see what comes up next.